November isn't exactly a month inspiring most to wax poetic. It's that dreary gray space between the wonderful reds and oranges of fall and the cool, crisp white of winter. It's also my birthday month, which tends to bring up personal melancholy (not related to getting older). But I love all seasons, and the changing nature of life, and upon reflection, I've realized two things, one trivial and one profound, about how small, unnoticed daily changes can add up to big results that kind of pounce on you one day (in a good way). As a child, I was really annoyed that everyone else got better gemstones and flowers associated with their birthday months (I said it was trivial!). I coveted February for wonderful amethyst, May for emerald, and December for turquoise. But, no, November is topaz, that shade of golden yellow just like appliances of the time. I hated it, though I never got any topaz jewelry, so I don't know why it was a big deal! And the November flower is mum, which at the time were also always depicted in that shade of yellow I hated, and I wasn't wild about mums, full stop. The other day I realized that my favorite gemstone today is amber, which comes in the exact same shade of yellow I hated as a child and now love. I also realized I love mums in all colors and that they are the perfect flower for a no-nonsense person who has always loved fall. I'd come full-circle without even realizing it. I also realized something, completely out of the blue the other day, and it made me all misty: I love my garden! When I moved into my house seven years ago, it had lawn up the the house. I've been making and planting beds, moving and expanding and transplanting, so long that I lost track of progress. I still had the mindset of my garden being new and sparse and not as full and lush as I'd like (some early photos here). I have a pretty big property for a city lot, and not a truckload of money, so it's taken a long time for beds to fill out. "Garden" has been very much a verb to me and it's exciting to see it afresh as a noun! 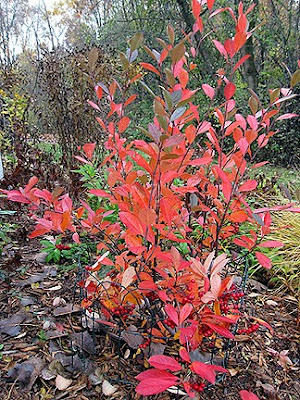 When photographing my garden for fall color, it dawned on me how many shrubs I have, and how wonderful their fall color is. I used to be very heavily into non-woodies and the transition to loving woodies (hey now, behave!) has been gradual and unnoticed. I still love non-woodies, too, of course. But realizing a huge amount of my plants were shrubs also explained why my spring-summer colors aren't as broad as what I see in others' gardens. I had always felt a bit was lacking in my garden, but now I feel abundance, gratitude, and warm fuzzies. Then MrBrownThumb commented about the number of shrubs, which made me wonder just how many I actually have. I was surprised to discover I have 39 needled shrubs and 41 non-needled shrubs! Eep! None is huge, and some are quite small, but I was not expecting that count. All this time, the garden has been growing around me, and I didn't even see it, especially not with my latest focus on buckthorn removal. And when I did finally see it, I almost cried because I finally realized how much progress I've made and how it's all come together, little bit by little bit. And when I realized how wonderful the garden actually looks (especially in fall) and how much my plants have grown, and that I actually have something to be proud of, a physical place that anchors me and holds my own roots, I did cry. I've never lived anywhere as long as seven years since I was a child, and I've never had so much time with any one garden. I've been working on personal growth for a while, too, and hope that, like with the garden, I've made more progress than I can see at any given vantage point. What a lovely post, Monica - it made me cry too! I'm going to read it again now. I have come to realize how very important it is to really value what we value individually as a person, if that makes sense. And to continually celebrate what we have done as individuals and feel proud. This is not dependent on others' recognition of what we have done, although that's always nice if they do! Your garden looks glorious. Wishing you more and more 'abundance, gratitude and warm fuzzies' - you deserve them! You just now realized you love your garden? Gosh I would think you knew that all the time since you spend so much time on it. The work is my love in the garden. Woodies are the absolute best too. You have a great amount of shrubs-wonderful. P.S. My birthday gem is periodot. I always loved it because it was green. It is nice to come full circle and now love yours. Loving woodies is a sign of a mature gardener. (Sorry, I couldn't help using "woodies" & "mature" in the same sentence. Clearly I'm not "mature.") Shrubs add structure and permanance to a planting, and your garden looks wonderful with so many. If you want to jazz up those shrubs a bit in summer, plant a Clematis to grow on each in its off season. The Viticellas are probably the best for that, as you cut them down every year. Monica....that was such a pleasure to read. I completely understand your emotion and the fact that you have fallen in love with your garden. It creeps up on you doesn't it......each day I notice a little something....something I had forgotten for a brief moment. Amber, now you are talking. When in Spain a few years ago I went into a shop that sold just amber...what an absolute paradise. The number of shurbs you have is impressive, heck your whole garden is impressive to me. You should be very proud of all the work you put into it. My birthday is also in November and I too hated topaz, even though I would never wear any stones (or jewelery for that matter) I'd would have preferred a different color, just in case. Patience and time are things that are hard to put up with in this age of instant gratification. But in gardening it does take a little at a time mostly to see the changes taking place. Happy Birthday, Monica! Your garden is the result of your loving labor in it. You have made quite a place there for yourself too. Shrubs are necessary for structure and add so much, way to go for planting so many. They were good choices too, all those wonderful viburnums. I have a theory that we love the season best that we were born in. I often ask someone what their favorite time of year is, then their birthday. It nearly always is the same. Topaz is so pretty, glad you love it now. It kinda sneaks up on us - but it sure does feel good to step back and take it all in. You have some really nice gardens. You should be very proud of what you've accomplished. You remember today's sleuthing? Well, I went to the source and asked, the date is November 9th. Happy Birthday Monica. It is great that you have a garden that is maturing right along with you. It is gorgeous just as you are. What with so many shrubs you can sit back and relax and just enjoy the show. I am so glad you have come to love your beautiful garden -- there's no better feeling. Seeing your post again from a year ago shows just how much work you have done and how far your garden has progressed, Monica. It really is lovely! It does take time to fulfill a vision, unless you've got the money to hire help and an unlimited plant budget. I know because I've only managed a few more yards of garden each year for the past 5 years. I probably spaded up one yard of dirt today, and my muscles are screaming at me for it:) It's wonderful that you can sit back now and really admire all that you have accomplised. By the way, my birthstone is a pearl, and I always wanted it to be a sapphire or opal! Happy Birthday, Monica! What a lovely thoughtful post. Just like our gardens, we are constantly changing. You were so smart to take pictures of the progress you have made, which is considerable. Who decided what gemstones are for which months? I say decide for yourself which gemstone you should have! Me? I like 'em all! Monica, A wonderful essay and delightful read! I totally get gradually arriving at love for a garden~~that's how I feel about mine. It sort of crept up on me, like the romantic who realizes she does love the boy next door best friend not the supposed to be Mr Right she's dating! Isn't that one of the TV of the week themes! It's a grand feeling. Happy Birthday month my friend!! The shrubs in your garden are awesome! Well, happy birthday, whenever it is. Amber is one of my favorites too. I have been looking for some amber stones to make a necklace. It really is a profound moment when you can look at your yard, evaluate the changes you have made and say this is my creation and I love it. Hope I get to that point someday. Liebe Monica, mein Englisch ist leider nicht so perfekt, dass ich alles verstanden habe. Aber so viel vielleicht, dass Du mit der grauen Novemberzeit früher nicht ganz Freund warst? Es ist auch Dein Geburtstagsmonat? Aber durch die Liebe zu Deinem Garten schätzt Du heute die sich verändernden Jahreszeiten. Das was ich verstanden habe, hat mich jedoch berührt. Sehr melancholische Gedanken. Ich hoffe nun, ich liege nicht ganz daneben. I know it is entirely possible to be in love with a garden! I really love shrubs too, I just wish I had room for more. That is a great photo - beautiful color. und ich finde es schön, dass du dich mit der Farbe des Topaz ausgesöhnt hast. Die Farben des Herbstes sind doch wunderschön, auch wenn dann im November das Grau irgendwann überwiegt. - Du kommst heute Abend bei mir in den "Topf" und ich drück dir die Daumen, dass das Los es gut mit dir meint. Wenn ja, dann könntest du vielleicht zweisprachig schreiben, das wäre schön. Vielen Dank, dass du mitmachen willst beim Adventskalenderprojekt. I'm so glad you've come to that realization about you and the garden. I'm still not there with my garden (and also being a November baby I never liked topaz either!). But I hope I'll get there someday. What a great treasure of shrubs you have! What a wonderful post Monica - and I am so happy for you and it was great to see all the changes and the lovely garden that you have created. This is such a wonderful post, and underscores just some of the reasons I like and admire you so much and am happy having your friendship. I can relate to the personal melancholy than comes up around our common birthday month, also not related to getting older (or at least, that's only a small part of it for me.) This year has been that way for me even more than most. I chuckled when I read your thoughts on our common birthstone, and have felt those exact same sentiments myself. What WERE they (whoever 'they' are) thinking! I have a good friend met through my last job who recently returned to her homeland of Poland. She introduced me to amber, and I've loved it since. I miss her alot, and amber now always makes me think of her, adding to my love of this interesting, beautiful stone. I love your garden too, and was so impressed with all the beautiful shrubs you've added and the gorgeous fall color you've got. We have hedge shrubs all over the place here as you've seen, and not necessarily pruned to my liking. With all those already here, I haven't added many shrubs to our actual garden space until this year. 'Course, they're tiny, and the rodents ate some of them down to the ground in September. But seeing how beautiful yours have become inspires me to keep adding more shrubs to our garden. You said "I've been working on personal growth for a while, too, and hope that, like with the garden, I've made more progress than I can see at any given vantage point." Isn't that the way it is! Like the garden, personal growth is gradual and not always so easy to see in ourselves. We can't take photos of it as we can of our gardens. Being inner work it's hard sometimes recognizing our progress. I hope along with celebrating the growth, progress, and beauty of your garden this birthday month, you'll trust your inner work is fruitful too, and celebrate that in this, your birthday month. A very moving post, Monica. I feel a strike of enlightenment when you talk about a verb shifting to a noun. I think that sense of 'lots here now' came through especially on your last post. P.S. I've found if you don't like the flowers and stones bestowed on you in one book, you can find different ones appointed in others. There's a proverb in there somewhere! L.
Great post! It's so easy to overlook the joys of what's right in front of us. Enjoy!